I recently purchased a Dell E520 computer after one of my colleagues tipped me off about a good deal on Dell’s website. The deal has since ended but both myself and the IT Manager at work managed to nab one for a princely sum of Â£329. The idea I had was basically to replace my current main machine which is now getting a bit long in the tooth. Albeit still being a perfectly capable machine it was time to move on to PCI-Express, SATA, Core 2Duo and DDR2 RAM. After literally hours of surfing the net looking at toms hardware and bit-tech reviews I settled on an ATI X1950XT, which is still quite a capable DirectX 9.0 card. The main reason I had to go with this particular card was that it was the best spec’d card I could get that might fit in the Dell case. The shroud that Dell mount around the Scythe Ninja type heatsink just gets in the way, especially in BTX designs. I was effectively limited to a single slot design too. 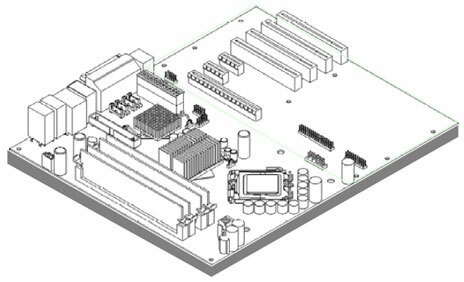 Anything faster than than an X1950XT was always dual slot design and, as well as the shroud issue, the PCI-Express slots on BTX designs are always at the top of the board so there’s literally nowhere for the mounting plate in a dual slot design to be. So I had a problem, but one that I thought would be easily solved with the purchase of a card that would only take up a single slot. Finding such a card isn’t the easiest task in the world either, that I can tell you! 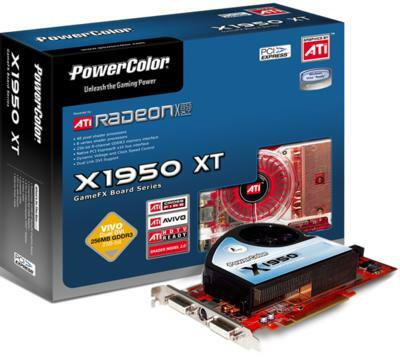 Needless to say, with the assistance of a colleague, I happened upon a PowerColor Radeon X1950XT 26MB PCI-E for a fairly decent price so I bought it online and awaited its arrival. When the card arrived I was a little horrified to see that although it looks like a single slot design on the imagery on the website, it’s actually a dual slot bracket supplied with the card! D’oh! Undeterred I whipped the mounting bracket off the card and attempted to fit the card. It slotted in beautifully. There was literally 2mm between the end of the heatsink on the graphics card and the CPU shroud, but, it fitted just nicely! Next problem was that this dual mounting bracket simply wasn’t going to work. I toyed with the idea of cobbling one together out of a normal blanking plate but that was just never going to work out right, so I decided to modify the bracket supplied with the card and chop the other side off. Half an hour later I had a single slot bracket/mounting plate and a card that fitted just nicely. All that was left was for me to whip the 550W Antec power supply out of my old case and plumb it in to the Dell box. Fortunately, Dell choose a normal ATX power supply for their builds but I had a bit of minor modding to do to the Dell case to get the Antec power supply in and all the power hooked up. When I turned on, everything burst in to life as expected and I had display through the new graphics card. After making some minor alterations to the BIOS at the behest of a warning message kindly provided by the Dell’s Power On Self Test, I was ready to install Windows XP Professional. For those people that want to install Windows XP on a Dell E520 you MUST change the Drive Configuration to IDE in the BIOS and not leave it set to AHCI/RAID. Otherwise once you boot from the Windows XP installation CD the computer will blue screen as it attempts to complete the boot process. After I’d installed Windows XP I went about installing the graphics card drivers for the new ATI card. Once completed, I rebooted as requested and… err, well, the monitor went to sleep. Hmm, perhaps the drivers had set a daft resolution/refresh rate on the card? So I rebooted, pressed F8 and went in to VGA only mode. Great, we have action. So I’ll just set the resolution and click OK…and…err…. the monitor goes to sleep again. Oh dear. Believe me when I say I tried absolutely everything I could think of. I re-installed Windows XP about 5 times, tried Vista Basic that came with the machine and even Ubuntu but I just got no love from the card at all. I now faced the possibility that I had modified the mounting bracket on a duff card and would need to RMA it with a modded bracket. Oh crap! One word went through my head; it began with S and ended with HIT. I thought about what I could do for a couple of days. I could send the card back “as is” and pray they don’t notice or, buy another exactly the same card, hope the new one works fine, swap the mounting brackets and nobody is any the wiser. After some serious thought I decided to go another route entirely. The PowerColor card that I bought fit like a glove so I thought why not maybe get an aftermarket VGA cooling fan such as the Zalman VF900Cu and a different card altogether? Storming idea! 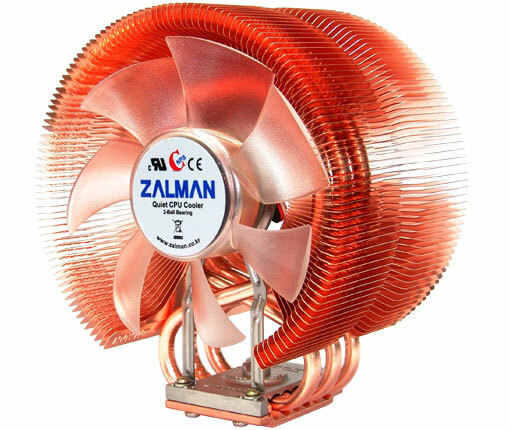 I’d get one that came with the infamous dual bracket and it didn’t matter about the heatsink that was on it when it came ‘cos I’d just whip it off and put the Zalman VF900Cu on it instead. This way I could swap the bracket, avoid the issue with sending back a card with a modded bracket and avoid the BTX design issue and shroud all in one go! Trouble is, it was going to cost me more money. Yes, my brain was hurting too after I’d been thinking about it for a few days. I ordered a Sapphire Radeon X1950XT 256MB PCI-E and Zalman VF900Cu from Pixmania and waited…and waited and waited. After four days of waiting for my order I got an email apologising for a technical issue they had in their distribution centre and that my order would be dispatched any day now. Oh great, cheers. I’d been given 14 days from the day I’d requested an RMA on this PowerColor card to send it back and already it had been 10! If I sent it back outside of the RMA, I wouldn’t get a refund and I’d probably have to pay for them to send it back to me again! Thankfully, on the 12th day my Pixmania order arrived so I did the necessary. I whipped the old card out, swapped the brackets, removed the heatsink from the Sapphire card, fitted the Zalman and stuck it in to the Dell case. Again it fitted perfectly. Hopefully you can see the issues I had to face from the next couple of shots that I took of the Sapphire card with the Zalman VF900Cu fitted and installed. 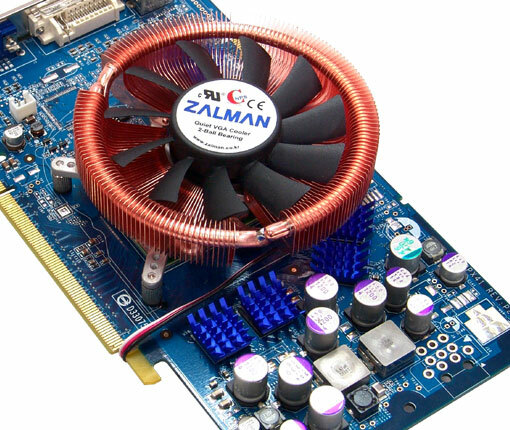 This image is of the Sapphire card with the manufacturer’s cooler still on it. So, the PowerColor card was on its way back to the retailer with an unmodded dual bracket, the Sapphire card had the Zalman VF900Cu fitted to it and it was in the E520. Woo! Everything was going smoothly so it was time to re-install Windows XP Professional again for the 85th time. I set about that and then of course the latest Catalyst Drivers from AMD’s website. Reboot and…… it worked, with one monitor (well, it didn’t put the monitor to sleep at least!). In to the Catalyst drivers I delved to set it to extend my desktop on to the secondary monitor that I had plugged in and….err dude, it doesn’t work. It would not under any circumstances let me extend my desktop on to the decondary monitor. I tried the Omega drivers, XP Pro 64 and associated drivers and Ubuntu but AGAIN I still could not get the desktop to extend, hell I couldn’t even clone the desktop! The ATI Tool in the Omega drivers kept reporting “No DDC” and after a bit of googling that turned out to be a Display Data Channel, whatever the hell that’s for. So here I was again, back at stage one. I had a Dell E520, a Sapphire Radeon X1950XT 256MB PCI-Express graphics card with a Zalman VF900Cu fitted to it and I still couldn’t get dual monitors to work. Arse! I thought about it logically and the only thing I could come up with was a motherboard issue. Perhaps the Dell E520 board simply doesn’t support two of these DDC channels? Yes it was a stab in the dark but it was the only component that was not made by someone else. Intel processor, Sapphire graphics card, Dell motherboard. Myes, Dell… motherboard. They’re not exactly renowned for their manufacturing prowess in this particular field are they? So a choice was made, I’ll just buy a decent motherboard. 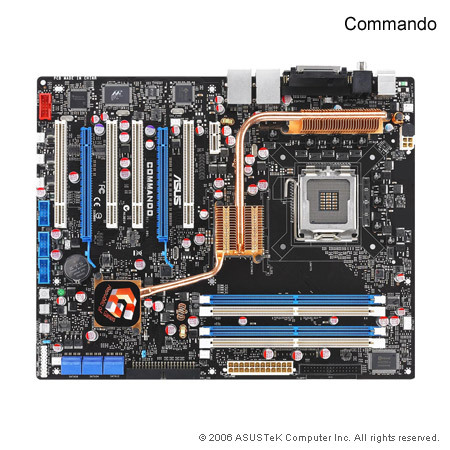 Hell, all this had been going on so flipping long I’d been paid again anyway so I thought I could spare a few quid and bought myself an Asus Commando ATX motherboard. The idea being that I’d gut the Dell E520 of its processor, RAM, SATA CD/DVD and use the new ATX motherboard, my old power supply and case and I’d be better placed for future upgrades. I got the Asus Commando motherboard with a Zalman CNPS9700 cooler (a really big CPU cooler) on a rapid delivery from Amazon and set about rebuilding my new machine in to my old Antec Sonata case with the Antec NeoHE power supply on Friday afternoon after I had returned from work. Amazon were actually the cheapest for this board, selling it at just Â£131 when I bought it on 24th May 2007. Everything went really well with the rebuild, even the cable routing went far better than I expected. It was a rather nail biting moment after I had installed Windows XP Professional and then acquired the latest Catalyst Drivers from AMD. Installation went without a hitch and after a reboot I was sitting staring at two monitors showing me exactly the same thing. My god it was actually doing cloning! Huzzah! This was obviously a step closer than I had been with the Dell motherboard so I did a celebratory dance (stop laughing!) and sat down to tweak the drivers to extend the desktop to the second monitor. A few bites of my nails later and all was perfect. I finally had an extended desktop on two 19″ monitors. Amusingly, there really wasn’t very much left of the E520. I’d literally paid Â£329 for just a few components and a 19″ monitor. There are a few elements that contribute to this rather tragic story; stupidity, impatience, more money than sense and stubbornness. So the upshot of all this is; if you want to put a decent graphics card in to a Dell E520 to get yourself an extended desktop over two monitors, don’t bother, it won’t work. Just buy yourself a decent computer to begin with! Thanks to Nick at work who helped me find the graphics cards and offered additional options when I was fresh out of them. Cheers! Some pics of my system. 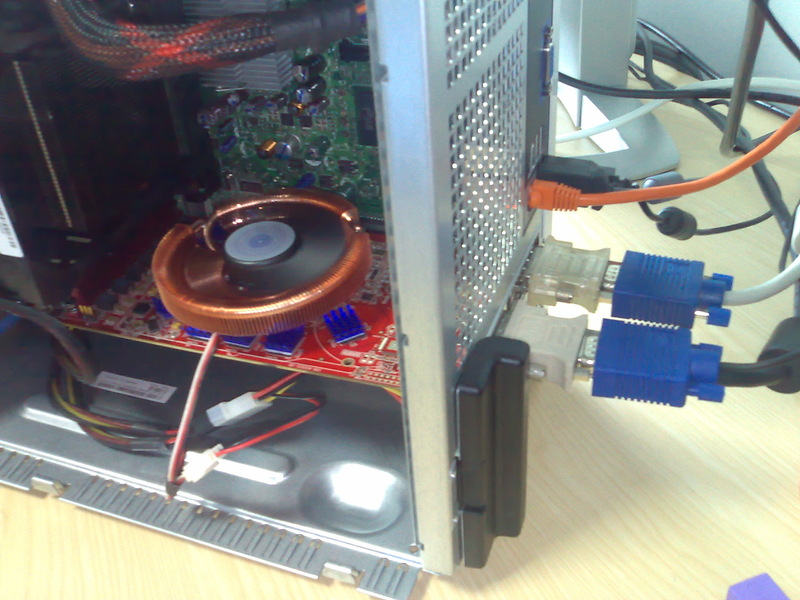 Are you aware that the power down of the video card is possibly the result of too little power? 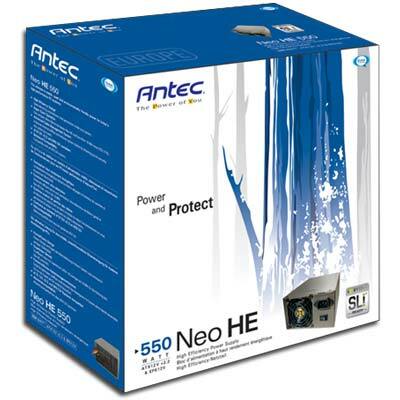 Hi Brian, the thought did cross my mind but I was running everything on an Antec NeoHE 550W power supply inside the Dell case. The Dell power supply is only 350W or 305W and doesn’t have any PCI-E connectors anyway so I needed to use another power supply. One of my photos above shows the power cables inside the Dell case from the Antec Power Supply. That’s a truly epic tale. Put paid to a similar scheme which I was cooking up. Instead I’ll just buy some decent components from scratch for a new system. You’ve saved me both time & money, and amused me enormously in the process 😉 – Thanks!! 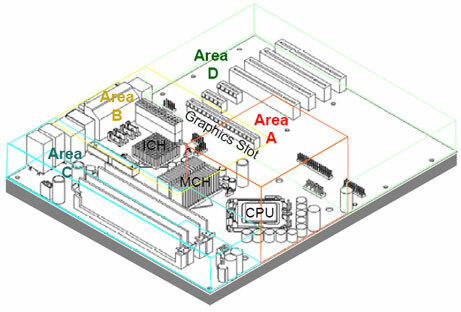 This is the 3.0 GHz Dual Core model of e520. They may have different mainboards, IDK. Re your comment about installing XP on E520. 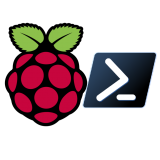 Your solution of turning off Raid in the bios does work but means that the drive is working in emulation mode. It is possible to leave the RAID setting in the bios (so you get native speed) and to install XP. You need a floppy on the system to do this. 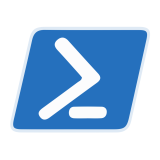 Download the latest drivers from the Dell site – currently R158601.exe file. 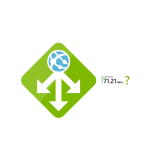 Unpack to a directory and copy to a floppy – can be done on any system doesn’t need to be the E520. Now boot the E520, press F12 to get boot menu and select CD. When XP starts to initialize it prompts you to press F6 if you have additional drivers to install. Do this. Later in the process, after other drivers have loaded, it prompts you to type S if you have drivers to load. Type S and put the floppy in drive A. A number of drivers will appear with one highlighted, hit return to accept the highlighted driver then return to continue. Let the install finish, only remove the floppy when instructed before the final reboot. Interestingly the above will not work if you use the Intel matrix driver that is on the Dell drivers CD that comes with the machine. It throws an error when trying to load the driver. You need the latest version from the Dell site. 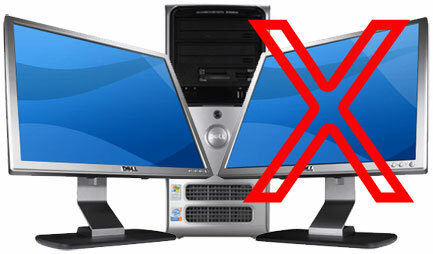 I can confirm that the Dell Dimension 9200 + Sapphire x1950xt + Dual monitor = doesn’t work. 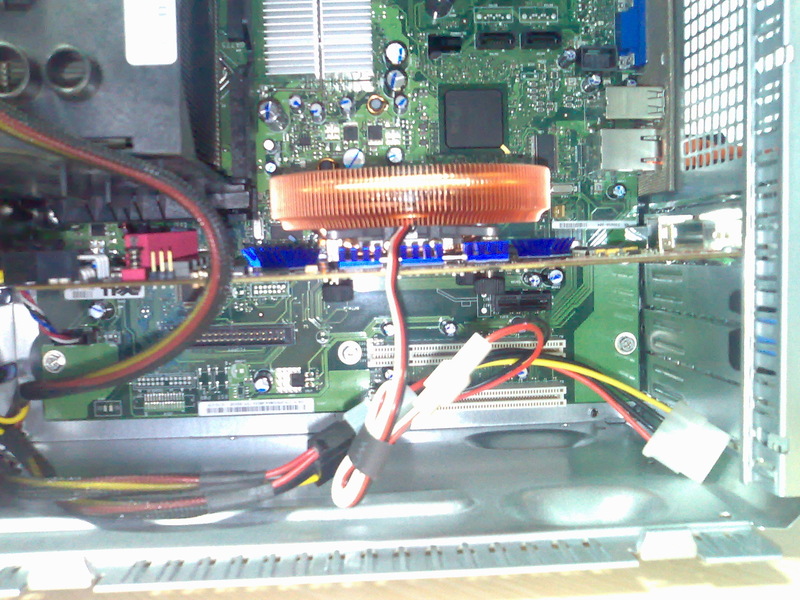 The Dell 9200 has a better power supply (375 watts) and can power the 8800GTS640 fine. This computer, however, does not work with the X1950XT in Dual monitor mode at all. I learned it the hard way and came out with $25 short in restocking fee (newegg). Stay away from DELL and X1950XT in dual mode. I would I read this article sooner, I would pick a diff video card for my Dell. E520 + X1950XT + Dual monitor mode = Dimension 9200 + X1950XT + Dual mode = DOES NOT WORK. When I found that, clicking the link went to a “page not found” filler. Now, I can no longer find any reference to this entry/problem. I am 100% sure ATI is aware of the issue but I have no idea what theyre doing to fix or if theyre even trying. Though I am led to believe they arent trying to fix it, since they took down that entry. I am not an Nvidia fan boy, and I work with many different models from both brands here. When the x1xxx series first came out, the possibilities of the new hardware tech excited me, and I thought for sure they would smoke Nvidia. Needless to say, that never happened. After working here for almost a year with primarily high-end cards from both brands, I can say that I would not ever buy an ATI, nor would I suggest it. Regardless of performance, ATI cant write software to save their God-forsaken lives (look at the Catalyst Control Center, which wont even open for 30% of the people who have it installed). Until you start reading about “ATI’s second coming” just stay away from them. They call it Nvidia for a reason (Nvidia is Latin, look up the definition), and they didnt choose green as their color scheme just because they like it. Oh and I saved the web page for the ATI search entry, which I will send to the owner of this page if they would like proof (proof in as much as it can be, considering one can easily spoof a saved web page). I can relate to your story as about a year and a half ago i purchased a dell e520 thinking that i could upgrade as i went. Only thing i would say is that the card is now running at 64c idle and up to 93c full load so a fan is needed next. Very amusing and imformative article, have been searching for ages to find something like this! I bought a Dell Dimension E520 way back in 2007. It was on the cheap, and like you I couldn’t resist! I wanted to set up an Avid editing system, and having never used Dell before assumed it would be OK to fiddle around with the components post-purchase. I bought an Avid certified Nvidia Quadro FX 3400 with the intention of setting up dual monitors. Unfortunately, DVI1 output does not work correctly and only displays greeny-blue colours as opposed to the full spectrum. I contacted Dell who were absolutely no help at all, and after several phone calls finally told me ‘this card is not compatible with your motherboard’. That’s a truly epic tale. Put paid to a similar scheme which I was cooking up. Instead I’ll just buy some decent components from scratch for a new system. You’ve saved me both time & money, and amused me enormously in the process – Thanks! !